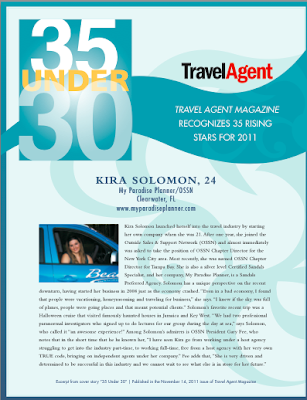 Our Owner & Founder Makes Travel Agent Magazines "Top 35 Agents Under 30" in 2011! Kira Solomon launched herself into the travel industry by starting her own company when she was 21. After one year, she joined the Outside Sales & Support Network (OSSN) and almost immediately was asked to take the position of OSSN Chapter Director for the New York City area. Most recently, she was named OSSN Chapter Director for Tampa Bay. She is also a silver level Certified Sandals Specialist, and her company, My Paradise Planner, is a Sandals Preferred Agency.